A new Windows 10 internal build 14978 information leaked online. Windows 10 Build 14978 and mobile build 10.0.14978.1000 is now under testing. The new builds were compiled on November 19, 2016. Microsoft also released new Windows 10 Creators Update insider build 14971 for fast ring insiders. Windows 10 Anniversary update cumulative update kb3200970 build 14393.447 for PC and mobile build 10.0.14393.448 is now available for users. 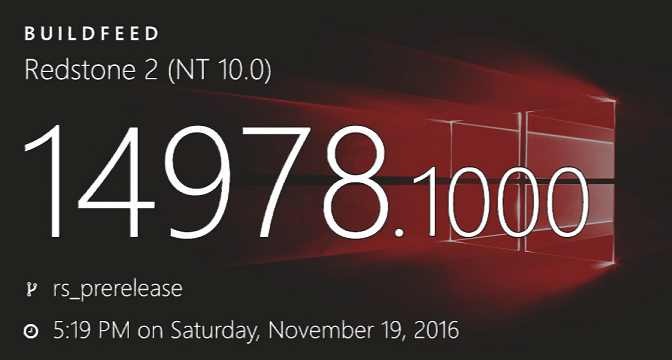 The company released cumulative update KB3198586 build 10586.679(Threshold 2) and update KB3198585 build 10240.17157(RTM) for users. Windows 10 build 14965 ISOs are now available for Slow Ring insiders. Microsoft officially announced that next Redstone 2 update will be called ‘Creators Update’. The Creators Update will be available in March-April 2017.